I’ve introduced a new class at Stanford to teach engineers, scientists and other professionals how startups really get built. They are going to get out of the building, build a company and get orders in ten weeks. Jon Feiber of Mohr Davidow Ventures and Ann Miura-Ko of Floodgate are co-teaching the class with me (and Alexander Osterwalder is a guest lecturer.) We have two great teaching assistants, plus we’ve rounded up a team of 25 mentors (VC’s and entrepreneurs) to help coach the teams. In contrast, startups search for a business model. (Or more accurately, startups are a temporary organization designed to search for a scalable and repeatable businessmodel.) There are few courses which teach aspiring entrepreneurs the skills (business models, customer and agile development, design thinking, etc.) to optimize this search. 2) business plans are fine for large companies where there is an existing market, existing product and existing customers. In a startup none of these are known. Therefore we developed a class to teach students how to think about all the parts of building a business, not just the product. What’s Different About the Class? This Stanford class will introduce management tools for entrepreneurs. We’ll build the class around the business model / customer development / agile development solution stack. Students will start by mapping their assumptions (their business model) and then each week test these hypotheses with customers and partners outside in the field (customer development) and use an iterative and incremental development methodology (agile development) to build the product. The goal is to get students out of the building to test each of the 9 parts of their business model, understand which of their assumptions were wrong, and figure out what they need to do fix it. Their objective is to get users, orders, customers, etc. (and if a web-based product, a minimum feature set,) all delivered in 10 weeks. Our objective is to get them using the tools that help startups to test their hypotheses and make adjustments when they learn that their original assumptions about their business are wrong. We want them to experience faulty assumptions not as a crisis, but as a learning event called a pivot —an opportunity to change the business model. During the first week of class, students form teams (optimally 4 people in a team but we’re flexible.) Their company can focus in any area– software, hardware, medical device or a service of any kind. The class meets ten times, once a week for three hours. In those three hours we’ll do two things. First, we’’ll lecture on one of the 9 building blocks of a business model (see diagram below, taken from Business Model Generation). Secondly, each student team will present “lessons learned” from their team’s experience getting out of the building learning, testing, iterating and/or pivoting their business model. What did you initially think? Then what did you learn? At the course’s end, each team will present their entire business model and highlight what they learned, their most important pivots and conclusions. We’re going to be teaching it for the first time in January. Below is the class syllabus. Class 1 is here. Follow along! This course provides real world, hands-on learning on what it’s like to actually start a high-tech company. This class is not about how to write a business plan. It’s not an exercise on how smart you are in a classroom, or how well you use the research library. The end result is not a PowerPoint slide deck for a VC presentation. Instead you will be getting your hands dirty talking to customers, partners, competitors, as you encounter the chaos and uncertainty of how a startup actually works. You’ll work in teams learning how to turn a great idea into a great company. You’ll learn how to use a business model to brainstorm each part of a company and customer development to get out of the classroom to see whether anyone other than you would want/use your product. Finally, you’ll see how agile development can help you rapidly iterate your product to build something customers will use and buy. Each week will be new adventure as you test each part of your business model and then share the hard earned knowledge with the rest of the class. Working with your team you will encounter issues on how to build and work with a team and we will help you understand how to build and manage the startup team. Besides the instructors and TA’s, each team will be assigned two mentors (an experienced entrepreneur and/or VC) to provide assistance and support. Suggested Projects: While your first instinct may be a web-based startup we suggest that you consider a subject in which you are a domain expert, such as your graduate research. In all cases, you should choose something for which you have passion, enthusiasm, and hopefully some expertise. Teams that select a web-based product will have to build the site for the class. Pre-reading For 1st Class: Read pages 1-51 of Osterwalder’s Business Model Generation. What’s a business model? What are the 9 parts of a business model? What are hypotheses? What is the Minimum Feature Set? 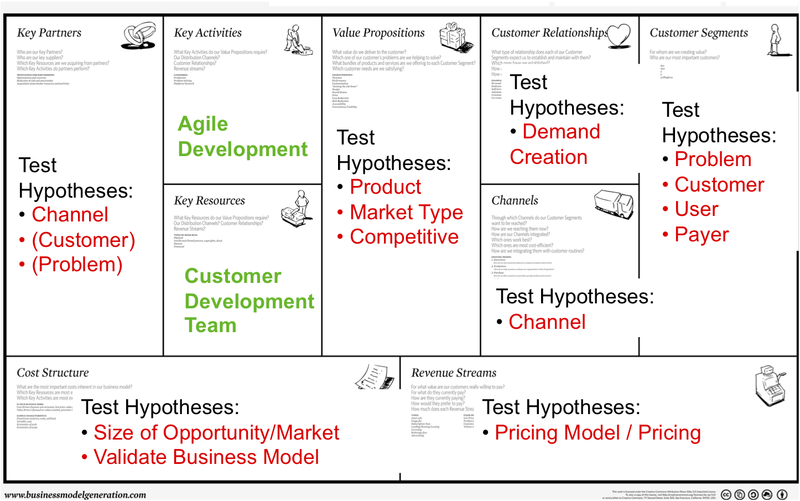 What experiments are needed to run to test business model hypotheses? What is market size? How to determine whether a business model is worth doing? Deliverable: Set up teams by Thursday, Jan 6 (a mixer will be hosted on Wednesday to help finalize teams). Submit your project for approval to the teaching team. Write down hypotheses for each of the 9 parts of the business model. Come up with what constitutes a pass/fail signal for the test (e.g. at what point would you say that your hypotheses wasn’t even close to correct)? Get quick feedback on your initial team business concept from the teaching team. What is your product or service? How does it differ from an idea? Why will people want it? Who’s the competition and how does your customer view these competitive offerings? Where’s the market? What’s the minimum feature set? What’s the Market Type? What was your inspiration or impetus? What assumptions drove you to this? What unique insight do you have into the market dynamics or into a technological shift that makes this a fresh opportunity? Find a name for your team. What were your value proposition hypotheses? What did you discover from customers? Submit interview notes, present results in class. Who’s the customer? User? Payer? How are they different? How can you reach them? How is a business customer different from a consumer? What were your hypotheses about who your users and customers were? Did you learn anything different? Submit interview notes, present results in class. Did anything change about Value Proposition? What are your hypotheses around customer acquisition costs? Can you articulate the direct benefits (economic or other) that are apparent? If your customer is part of a company, who is the decision maker, how large is the budget they have authority over, what are they spending it on today, and how are they individually evaluated within that organization, and how will this buying decision be made? For web startups, start coding the product. Setup your Google or Amazon cloud infrastructure. change messaging on site during the week to get costs lower, team that gets lowest delta costs wins. If you’re assuming virality of your product, you will need to show viral propagation of your product and the improvement of your viral coefficient over several experiments. build demand creation budget and forecast. Get real costs from suppliers. Did anything change about Value Proposition or Customers/Users or Channel? Present and explain your marketing campaign. What worked best and why? Action: If you’re building a web site, get the site up and running, including minimal feature. For non-web products, get out of the building talk to 10-15 channel partners. Get a working web site and analytics up and running. Track where your visitors are coming from (marketing campaign, search engine, etc) and how their behavior differs. What were your hypotheses about your web site results? Submit web data or customer interview notes, present results in class. Did anything change about Value Proposition or Customers/Users? What is your assumed customer lifetime value? Are there any proxy companies that would suggest that this is a reasonable number? Interview 10-15 people in your channel (salesmen, OEM’s, etc.). What is your customer lifetime value? Channel incentives – does your product or proposition extend or replace existing revenue for the channel? What is the “cost” of your channel, and it’s efficiency vs. your selling price. What kind of initial feedback did you receive from your users? What are the entry barriers? What’s a revenue model? What types of revenue streams are there? How does it differ on the web versus other channels? Action: What’s your revenue model? How will you package your product into various offerings if you have more than one? How will you price the offerings? What are the key financials metrics for your business model? Test pricing in front of 100 customers on the web, 10-15 customers non-web. Assemble an income statement for the your business model. Lifetime value calculation for customers. Did anything change about Value Proposition or Customers/Users, Channel, Demand Creation, Revenue Model? Who are partners? Strategic alliances, competition, joint ventures, buyer supplier, licensees. Action: What partners will you need? Why do you need them and what are risks? Why will they partner with you? What’s the cost of the partnership? What are the benefits for an exclusive partnership? Assemble an income statement for the your business model. Did anything change about Value Proposition or Customers/Users, Channel, Demand Creation? What are the incentives and impediments for the partners? What resources do you need to build this business? How many people? What kind? Any hardware or software you need to buy? Any IP you need to license? How much money do you need to raise? When? Why? Importance of cash flows? When do you get paid vs. when do you pay others? Action: What’s your expense model? What are the key financials metrics for costs in your business model? Costs vs. ramp vs. product iteration? Access to resources. What is the best place for your business? Where is your cash flow break-even point? Assemble a resources assumptions spreadsheet. Include people, hardware, software, prototypes, financing, etc. When will you need these resources? Roll up all the costs from partners, resources and activities in a spreadsheet by time. Did anything change about Value Proposition or Customers/Users, Channel, Demand Creation/Partners? Deliverable: Each team will present a 30 minute “Lessons Learned” presentation about their business. Show off your product to the public and real VC’s. Set up a booth, put up posters, run demos, etc. Food and refreshments provided. Pretty good syllabus. What’s the plan for teaching fund raising if any? student companies should not be helped for fund raising.. In reality, students must bootstrap and launch and run their enterprise for better learning experiences rather than seeking funds for their startup from outside.. This is a fantastic idea Steve, just reading thru the course description is educational…. Any possibility it can be applied to or transferred to entrepreneuors already in a startup? Couldn’t the lectures and discussions be webcast and recorded? I think this would be a viral hit! I must agree, the concept and thought here is brilliant and surely will be inspiring. If any of this could be shared via podcast, webcast, or similar that would be brilliant. Even just as part of an end of week lecture overview. And from Stanford etc’s point of view this would surely be brilliant “advertising” for the course and related as a whole if nothing else. I’ve not wanted to move to the Valley more than I do right now. This looks to be an exceptional step forward in entrepreneurial education. I can only hope that the BMC will provide a similar experience (albeit self-driven). Amazing. This should be the blueprint for entrepreneurship education. Can’t wait to hear more about how the course progresses. Hope to see a lots more startups and a few less dusty business plans as a direct result! Dear Steve, Good to know your work. Great work. I am a professor from India. I dont teach Enterpreneurship.. but I am working on making any kind of learning an Enterpreneurial one. 1. Purpose of Enterpreneurship education is not developing Enterprise but Enterpreneur. 2. Enterpreneurship cannot and need not limited to one single course called Enterpreneurship. Project Startup search need to relate to all other courses.. Cool! It will be great to read progress reports from the class to see what real problems students encountered and resolved. Also, viewing this class itself as a startup, it will be interesting to see how the class pivots. will we get an ongoing story? great project Steve to put into practice from the green field all the theory…we can think to transfer the model (driven by you 😉 somewhere else…..! Now this is a course that is actually useful, helpful, and realistic for individuals diving into startups, compared with other “Entrepreneurship” courses from other colleges (even Babson College). I would love to see this upcoming course on iTunesU or somewhere accessible. I think it will great help entrepreneurs that are not based in the West Coast (like me). I second the vote to publish the video lectures on iTunesU! Please make this available on iTunesU! Issue: user vs. payer. If you plan to make money off advertising, how you can possibly meet anyone? The organization that pays you may be in NYC if not in Europe. Ditto for web users – for my current product 80% of them are 10-14 hours by plane away. And they sure will drop the product the first second anyone tries to bug them with a question – simply for privacy concerns. All you can learn is to study them remotely. Also, Google Analytics does NOT give you access to individual user data. You only get aggregates that can be quite detailed but stop at a certain level. for example, you can only drill down to a city level, but not beyond. And for any given report you can only combine 2 metrics in a 2d matrix, there is no multi-factor analysis. So, given that – how will students apply this methodology? While I’m obviously not Steve, I’m going to try and address your concerns, if only for my own benefit as a student applying this methodology to (you said it!) a web startup. Regarding advertisers as a consumer segment: The goal of customer development is to validate untested assumptions and hypotheses. As you stated, it would be quite ridiculous to assume that students would travel to companies that would hypothetically advertise with them, and even more ridiculous to assume that these advertisers would accept such a meeting in the first place. Thankfully, we need not worry, as assumptions about online advertising have already been validated. Advertisers are interested, at the most fundamental level, in eyeballs. While other factors, such as targeted demographic information, creative platforms, et cetera, will help to increase conversion and therefore revenue, they can be tested largely without the involvement of actual advertisers. Of course, understanding how online advertising works is an important part of customer development for these web startups. Once that’s accomplished, however, the main job of the students becomes testing and confirming their model in relation to the users. Now, this factors into your second concern: the difficulty of personal communication with such users. First, I believe that your assessment of how a user reacts to contact is simply untrue. If users immediately drop your product upon being contacted by you for feedback, then I’d further contend that you’re not providing them with something they actually like, much less love. And your argument of personal privacy seems to be nothing more than speculation. That customer development has been applied to various web startups since ‘Four Steps’ was released in 2006 proves that users are willing to talk. So, assuming that users are willing to interact, we can move onto another issue: how do you interact meaningfully with someone whom you cannot speak to face-to-face? The answer: Be creative. I, for instance, use Skype, whose screencast feature allows me to talk through a short keynote presentation on the problem that I believe I’ve identified and my proposed solution. From there, I move to video, or if the user prefers, just voice, where I can receive feedback. The presentation takes less than 3 minutes, and the whole thing lasts as long as the user wants to talk. Sometimes feedback is terse, sometimes it is extensive. Every time, I try to dig deeper. After we speak, I always follow up with a survey to gather demographic information and a request to contact them again for further feedback later down the development path. As far as Google Analytics goes, I believe Steve’s referring more to tracking customer acquisition funnels and/or choke points, as opposed to incredibly specific demographic information. You are rightfully calling this an assumption, and this is something that is a subject for hypothesis testing. What I feel you do is confuse users taking initiative to talk with a service taking initiative to talk. Most web services listen to what users want to tell them. Like, chatting on an online forum or facebook page. However, what would your reaction be if you sit at home and a telemarketer calls you? You’ll drop the phone in an instant and possibly even swear if your favorite show were interrupted. Now imagine say a mobile game. Like angry birds. How would you proceed in getting to talk to its users? Your steps 1, 2, 3? I apparently cannot reply to replies of replies, so here shall I reply! Regarding the telemarketer analogy: I do not believe that it is well suited to what happens in Customer Development. The reason telemarketers are so disliked is fairly simple… they’re interruptive! A call forces you to stop what you’re doing, pick up the phone, only to be addressed by someone who does not truly care about your needs. Cold calling, then, would not be well suited for general consumers (though it can definitely be appropriate for B2B, as a savvy businessperson would be more willing to discuss that which could help their business). Email, is a perfect way to open the lines of communication with consumers. Of course, not all will be open to talking to you, but plenty will be. The key is to be a person, not an automation (as compared to a telemarketer, who is effectively an automation). If you take a personal interest in people, they will take a personal interest in you. What happens, however, when you don’t have a good way to contact consumers? You pose the example of a mobile game such as Angry Birds. First off, game creation requires completely different tactics in a launch than does a web app. Most likely, you’re at the very least resegmenting a market (if not creating a new market) when you launch your web app, but you’re almost always entering an existing market when you create a game (this is obviously not always the case [see: social gaming], but it is relevant to Angry Birds, for instance). As you’re entering an existing market, you’re competing on performance and features, not the fact that you’ve invented some new thing called a game. This is less well suited for an MVP approach, though you can still implement a form of Customer Development. When Rovio launched Angry Birds on Android not too long ago, they took extra measure to open channels of communication during their beta release. Every time you launched the game, there was a convenient front-page link to provide feedback. So, even in this example, an example in which Customer Development is difficult to implement, Rovio took measures to better understand their customers. And, guess what? They pivoted based on that feedback! Their pricing model changed: Instead of offering only a paid full-version of the game (like they did with the iPhone), they chose to release a full-version with ad support. Moral of the story: Customer Development isn’t perfect, and cannot be blindly applied to every scenario. It is, however, incredibly useful in most cases. As you can’t teach every single scenario in one class, I’ll imagine that Steve will encourage students to pick a strategy that can best incorporate CD. It may not be perfect, but it sure as hell is better than what’s being taught in most classes right now. Sorry, but you don’t need CustDev for that at all! Anyone except absolute novices on Android knows that Android is not good for paid apps, people hate to pay and cannot pay. Android app monetization rate is under 10%, compared to iPhone’s 36% – this is a fairly old study. This might change with carrier billing but it is only 3 days old. So you do not have a lot of choice. Any chance that anyone other than Stanford students will have access to this coursework at any point? If not, I guess I will have to apply for the fall, try to get in, and take this one class. I know that it is a great proving ground because you teach there, but I feel like this kind of class is exactly what I need. Excellent course! Will this be made available as part of the “Graduate Certificate” or “Professional Certificate” programs in stanford or a separate course? I couldn’t find the registration information for “ENGR 245” (I guess the registration is closed for Winter). Pls give us a heads up when this course will be offered again and will be available for registration. For the people wanting to take the class, I found this snippet from the course log that answers you question. • Admission is by enrollment application due by the end of the first day of class. • You must attend the first class to be considered for enrollment. • There’s a mandatory student mixer on Wednesday, January 5th at 5PM at the Treehouse. Students will form teams and select their preferred mentors. ▪ E 245 is only open to graduate students at Stanford. priority is providing a learning environment for Stanford Graduate students. ▪ Each team must have 4 Stanford Graduate students. ▪ Exceptions for team size and external members will be made on a case-by-case basis. ▪ There are no remote options for this course – you must take E 245 on campus. Thanks for the clarification Satish. Steve – is there any plans to open it of non-graduate students. Sorry, no. Eng245 is for grad students only. The class for Stanford undergrads is Engr 145. It’s a wonderful course taught by Tom Byers, Chuck Easley and Tom Kosnick. It’s offered almost every quarter. Alexander Osterwalder has a new blog post about combining business model generation with customer development. Here are the lessons learned by MIT entrepreneurship students on a recent silicon valley tour. What are the main differences between the Lean Launchpad class and the similar-sounding Technology Entrepreneurship class offered online at Stanford in 2012? The Lean Launchpad class is a team-based, hands-on class. Students come in with real projects and then use the business model canvas and customer development to get out of the building testing their hypotheses (week by week marching through each of the 9 business model components) while building their product. They keep a live blog of their Customer Discovery progress, and present a 10-minute summary each week in class of: here’s what we thought, so here’s what we did, then here’s what we found, so here’s what were going to do next week. The teaching team critiques and offers advice on progress, direction and strategy. This type of class doesn’t lend itself to scale to thousands of students. Therefore the Technology Entrepreneurship class will offer a business model canvas and customer development lectures, covering all the topics in Osterwalders Business Model Canvas and my 2012 version of the Four Steps to the Epiphany. But it does not provide the same type of team activities and instructor feedback of the other class. Thanks for the info, but I’m not totally certain I understand. It sounds like you’re describing the difference between your hands-on class, and your upcoming thousands-of-students online offering. It makes sense that with so many students, you can’t offer the same kind of critiques and advice about student business plans. But I want to understand the difference between your online Stanford offering (http://www.launchpad-class.org) and the similar-sounding Stanford course taught by Chuck Eesley (http://www.venture-class.org). My class assume you already know all that and you now want to know how to build the product, get customers and build the company. Great focus. Students also would benefit from insight regarding character and tenacity required to whether the personal and financial challenges they are likely to encounter. Faint of heart need not attempt.